NAM carriages are twinette sleeper cars, with compartments to accomodate two people. 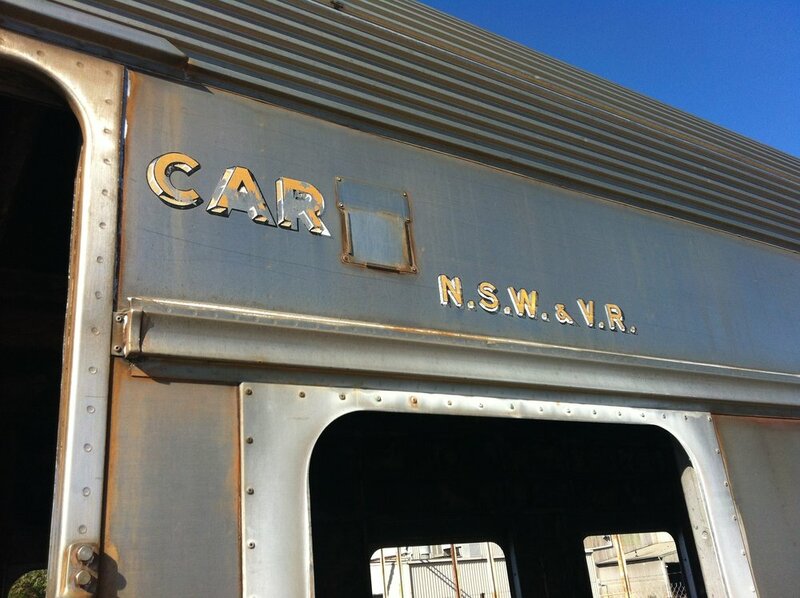 Introduced to the public in April 1962 as the Southern Aurora these carriages were one of several types of stainless steel cars which became the gleaming features of the inter-capital overnight express services between Sydney and Melbourne. NAM 2337 was purchased by VLine in 2016 from a private buyer, and the preparations were made to convert it to a power van to be used on the North East Line. These preparations included complete removal of all internals and windows to create a bare shell. At this stage a full engineering assessment was done to ensure the carriage was suited to its intended new purpose, but it failed to meet those requirements. In early 2018 the Violet Town community commenced negotiations with VLine to get access to the car as part of the Southern Aurora commemoration gardens being created. In July 2018 the VLine Board kindly agreed to donate the carriage to the Southern Aurora commemoration project located at Violet Town. The community plan is to use the carriage as a feature in the gardens area, at first as a cleaned up and sealed empty shell. Subject to funding, volunteers and resources the community intends to gradually rebuild the inside of the carriage, perhaps as an exhibition space and help tell the story of the amazing service which this carriage and its siblings have provided since 1962 in various guises. Violet Town and other communities along the NE line are very fond of the Aurora and the glamour it brought to rail travel. We hope to focus on the great things this train provided to the interstate traveler through the siting of this carriage. We will also tell the human stories associated with the crash of 1969: the crash and aftermath created indelible bonds between the community and all those affected. It will also help us respectfully acknowledge all those affected by the tragedy in so many ways, and their families, friends, neighbours and colleagues.